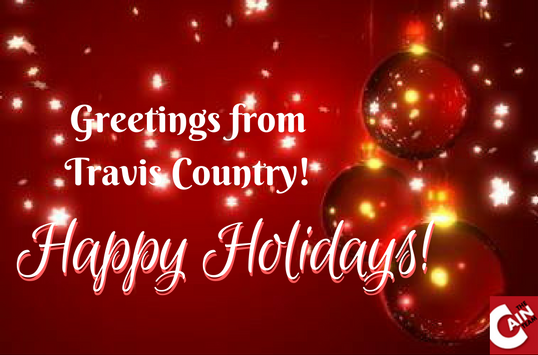 Travis Country residents, let us all welcome the holiday season! The Travis Country community will celebrate the holidays by singing carols and spreading good cheer as led by our very own TC Star-Spangled Singers! Please bring your own folding chairs, special cookies, and wear your Christmas outfit to your heart's desire! Help with decorating and singing practice is much appreciated! To know more details about this event, you may get in touch with Gail Totten at gailtotten@gmail.com. Took the time to decorate your home? Please make sure to have your Christmas lights turned on from dusk til 10PM on Dec. 11-20, so the judges can drive by and give your effort a score! Winners of the contest will receive a yard sign declaring their holiday spirit and a Home Depot gift card. For more information, please send an email to social@traviscountry.com. The winners will be announced on Wednesday, Dec. 21, via the Travis Country Facebook Page, TC Notes, and Next Door. What are you waiting for? You have 6 days to go... get those lights set up and dont miss your chance to have a shining moment at Travis Country (literally!). For more information, you can visit the official Facebook page of Travis Country by clicking on this link.